MIAMI — Veteran Miami Marlins right-hander Dan Straily has a 5.52 ERA this year at Marlins Park, which is where he will start on Wednesday. He has a 3.67 ERA on the road. Straily will be opposed on Wednesday by Milwaukee Brewers rookie right-hander Freddy Peralta, who has been outstanding at home (0.69 ERA) but has struggled at times on the road. In fact, in Peralta’s last road start, on July 1 against the Cincinnati Reds, he needed 43 pitches to escape a three-run first inning without further damage. That’s the setup for Wednesday’s rubber game of this series between the first-place Brewers (55-37) of the National League Central and the last-place Marlins (38-56) of the NL East. 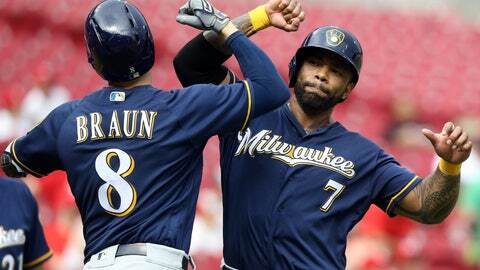 Miami earned a 4-3 walk-off win on Monday, and the Brewers prevailed 8-4 on Tuesday. Straily (3-4, 4.55 ERA) has pitched better of late, lasting at least six innings in three straight starts. His fastball, at 90 mph, is well below the major league average, but Straily, 29, is a crafty veteran. Straily is 4-0 with a 2.12 ERA in six career appearances, including five starts, against Milwaukee. Peralta, a 22-year-old from the Dominican Republic, made his major league debut this year on May 13 and is 4-1 with a 2.14 ERA in six appearances, all of them starts. He is also a pitcher who operates with below-average velocity (91 mph). He has never faced the Marlins. Wednesday’s game will not only mark the end of this series but also put a close on the return “home” for Christian Yelich, who had come up through the minors with the Marlins until he was traded to Milwaukee this past offseason. Yelich, who went 3-for-5 with four RBIs in Tuesday’s Brewers win, said he has enjoyed the experience so far. “It’s cool to come back (to Marlins Park) with a winning team,” Yelich said of his Brewers, who have the best record in the National League. “It’s (also) great to see familiar faces (at Marlins Park). This is where it started for me. You get all those memories of your first game here as a rookie. It’s special. Brewers manager Craig Counsell is thrilled for Yelich, who was named an All-Star for the first time on Sunday. The only disappointment for Yelich is the fact that catcher J.T. Realmuto, his best friend on the Marlins, is not here. Realmuto, of course, has a good excuse as he is on paternity leave. Yelich said he and Realmuto exchanged text messages on Sunday when it was announced that both of them had made the All-Star Game for the first time. “We were talking about how special it will be to share our first All-Star Game,” Yelich said of his former roommate, Realmuto. “It’s only fitting because we had so many memorable moments coming up through the minors, going through ups and downs. Marlins manager Don Mattingly, who thought Realmuto should’ve been in the All-Star Game starting lineup instead of making the team as a reserve, agreed.